Hi, it's been quite a while since i visited my own blog. I've been wanting to but been so couped up with my work schedules and by the time I got back home just in time to put my kids to sleep, shower and go to bed. Been traveling a lot to conduct Image workshops plus juggling the time in between to prepare for my Image column for The Sunday Star weekly and now I have a multilevel marketing business to concentrate on is quite a handful task and a big responsibility. Just got back from Jakarta to conduct an Image workshop for the Vvips of Indonesia that includes deputy ministers, ambassadors wives , entrepreneurs and the wives of Indonesian conglomerates organized by the Malaysian Ladies Association in Jakarta headed by the Malaysian Embassy. It was an awesome and fruitful experience networking with all the influential ladies of Indonesia and of course being able to penetrate into another market segmentation in another country. It was really interesting to see how the ladies over there really took the initiatives and extra effort to look good and dress up for the occasion. It's quite a difference compared to our Malaysian ladies where they need to be told to do it at times. I managed to sell all 50 copies of my books and there have been requests to invite me there again to conduct workshops for their respective organizations. I am really looking forward to that definitely. As always, I like to see things in different perspectives and I see opportunities in everything. I was also being told that it would be a great idea to market Adamaya products there and their population is huge . Well I might just do that.... soon. Talking about my multilevel marketing business, I am now in the midths of doing a road tour with the Adamaya team and leaders in a few states in Malaysia. Since we finally got our AJL [ Akta Jualan Langsung a direct sales licence to trade] licence last month , we are moving aggressively to promote our consumer product label and brand , Adamaya. We have covered Skudai and Masai in Johor, Kuala Pilah in Melaka, Butterworth and moving on to Sungai Petani Kedah and also a few places in Ipoh. We will be going to the east coast after I come back from my AICI conference in Vancouver , Canada and New York ,the first week of June. This is my new life now.. meeting people from the rural areas and offering job and business oppportunities and the chance to generate extra income for their families . Mind you this is the best business to venture into if you want to have the financial freedom and become a millionaire in no time. Adamaya is a product based multilevel company that will be around for a very long time. My vision is to make it a legacy for many generations to come and it will be one of the biggest if not the biggest in the world one day ..insyaallah .This is my vow and I hope the universe is listening! IT IS NOT A MONEY GAME . So for those of you who are interested to create a passive income don't hesitate to join us and we will give you all the support you need. All you have to do is to believe in Adamaya. Adamaya is also a registered trademark since 2006 and no parties are allowed to use this brand name for business or commercial purposes without our consent. We would like to highlight this matter because we found out that there are a few parties who have used our brand name to operate a cafe, spa and also a TV drama series.. I hereby confirmed that we are the only owner and founder of this registered trademark and our nature of business started out as a Hairsalon then into Image Consultancy and now our latest diversification is into a Multilevel Marketing Company. Please be informed. If you come across anyone using my brand name, Adamaya, for other businesses , please do not hesitate to email me at shawady@yahoo.com immediately. Your co-operation is highly appreciated. It happened the minute i got out of the car when i arrived at a friends's book launch. It was quite embarassing when i actually had to be held in the arms to walk and another friend had to carry my handbag and my high heels. So i left early and amazingly i could drive and it didnt hurt when i was sitting down. My thoughts were running wild thinking of the pain and full of what if's. Then i realized i should controll all these negative thoughts and tried to recall the solutions when it happened to me before back in the 90's when i was flying with MAS- when it all started, I had a slipped disc.I found out that Pak Cik Ngah , the old ustaz a family friend from Kota Bharu have already passed away a few years ago. No physiotherapies or medicine in hospitals could help but what he did to me was a miracle. I remembered I flew to Kota Bharu on a wheel chair but came back 4 days after that walking nicely. Everyone suggested i go for the operation and some of my friends now who opted for the operation are now suffering from parralysis. I heard of this special man who is also neurology specialist serving in a few hopspitals in K.L from a good friend who is a masseuse and I went to his clinic in Gombak 2 days ago with my husband.. That day i couldnt even walk or stand properly and the pain was exruciating. What he did was he fixed 'all the alignments in my whole body ' and it was quite painful. That night I could sleep and there was no more pain but i still couldnt stand properly. I felt like an old lady. The next day I went for my second treatment and alhamdulillah today i'm able to stand up straight again but with very careful steps and care. Its amazing how he does it and i think this guy should be given so much credit for what he's doing .The hospitals are charging so much for all these physiotherapies techniques that only could relieve you temporarily but do not cure you! So I'm still resting and taking the opportunity to catch up on my reading and surfing the net for some information and knowledge. The most important thing for me now is to get well and I cant wait to start work again. What's life without being able to do what you love doing and without being able to enjoy the moments of happiness with your loved ones. This experience taught me how important it is to take care of your health and there's nothing more important than having good health than so much wealth but not being able to enjoy life to the fullest. Moral of the story is Health Is Wealth. With good health you can create wealth but with wealth not necessarily you can get your health back. The new 2010 curtain has been raised and we are supposed to welcome it by moving on to the next chapter in life with much renewed optimisms and super re-charged energy. Analysts in America were heard saying that the economic crisis 'syndrome' is slowly fading out and on the other note this year of the Tiger, many Feng Shui masters are predicting that it will be a challenging year but we are encouraged to use our personal and individual talents that could land us a sudden luck and great opportunities. Well haven't we heard all these before...they do sound familiar right. 2009 has been good year for me as well as my career development is concerned. I'm glad that our society now have started to realize the importance of having the right Image for their staff to represent their companies and organizations and therefor the requests for Image Workshops have increased tremendously. 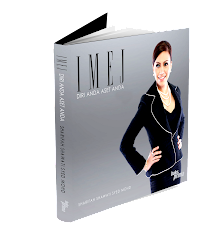 My first book on Image Building titled 'Imej- Diri Anda Aset Anda' was launched successfully by ex Minister of Trade Tan Sri Rafidah Aziz who happens to be my Icon. An unforgettable moment ever. Adamaya my company, from a HairSalon and an Image Consultancy firm , we have extended our wings to another diversification which is Product Manufacturing , Marketing and Trading services. Adamaya Marketing Sdn Bhd was created. We have also secured some great projects for Adamaya Marketing and we believe that 2010 will be a productive year for everyone who have joined us. Then it was an offer to host a reality show on TV9 called 'Gadis Melayu' for 12 episodes. 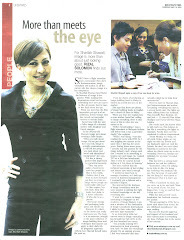 Then another offer to be the Image columnist for Mingguan The Star for Star publications for whole year 2010. Then being given the title as the 20 Most Glam by 'GLAM' magazine was an honour. My hope for this year is to materialise my dreams and vision to make 'Adamaya' a well known brand all over Malaysia , then Asia in the arena of Multilevel Marketing Business. 'Adamaya' product lines will be officially launched before the Chinese New Year celebration at its headquarters in Kota Damansara near Sg Buloh. Well for me no matter what Adamaya is moving on with great speed and there's no stopping us! To me there's no point in making new resolutions every year when the old ones were kept unresolved... be it in your career, family or personal relationships .. sometimes there are a few issues/things/people you need to let go in order to free yourself from the emotional burden you've been having that became the barriers and limitations towards showing your full potential and giving your best focus in achieving your goals. Get it ? Happy New Year 2010 to everyone and wish you all the best !